Huntwatch - Jackson Wild: Nature. Media. Impact. Huntwatch highlights the tumultuous history that is the East Coast Canadian commercial seal hunt. Forty plus years of ongoing activism, that included filming the hunt with an unblinking eye, brought images of the bloody ice floes to homes around the world. Garnering international headlines and sparking what some believe to be the start of the modern animal welfare movement, the hunt was almost brought to an end in the eighties. But by exploiting regional political tensions and blaming seals for decreasing fish stocks, the Canadian government continues to keep the East Coast seal hunt alive. Seal-hunting in Canada is a complex and layered issue. Stay educated on the web of influences between the Canadian government, commercial hunters, the fur industry, animal protection groups, and indigenous peoples. For further viewing on seal hunting from a different perspective, watch Angry Inuk (2016). Follow the work of Harpseals.org for more information. 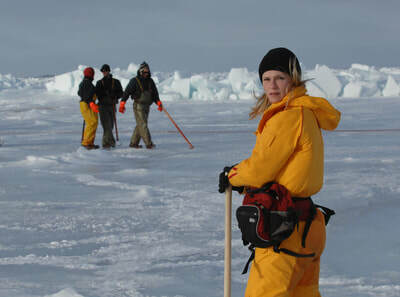 Thirteen years ago I saw my first seal hunt video - young seals, clubs and blood. It was too much for my soft heart. I avoided ever looking at this graphic footage again. Five years later, I was reintroduced while taking inventory of the film and video archives of the International Fund for Animal Welfare (IFAW) in London and discovered a treasure trove. One film stood out called Sealsong. It featured IFAW founder Brian Davies sporting his aviator glasses flying helicopters, diving under the frozen ice and fighting the political system – all to save the baby harp seals from slaughter in Canada. Looking deeper there was even more - death threats, spy tactics, knife attacks and destroyed helicopters.A crusader for the seals, Davies devoted his life to end the hunt and I truly admire his courage and tenacity. The story captivated me and I needed to find a way to make a movie about it. This would be much more in depth than the simple documentary shorts I had made in the past – a feature. It would be a huge undertaking. The greatest challenge of filming Huntwatch was getting the imagery. The activists were trying to film seal hunting to make sure the hunters were following the rules, but the hunters didn’t want to be filmed. To capture footage our camera team had to endure incredible and dangerous challenges including hanging out of helicopters and using undercover spy cameras. They were attacked with a knife, endured a three day hostage situation, encountered dangerous weather, stood up to powerful politicians - all to save the seals. Some of our archive footage is incredibly disturbing, so we had to find a way to make the film watchable and entertaining to a broad audience. We worked very hard at finding lighter moments and human drama, trying to focus in on the characters to tell the story of their experiences around the seal hunt. The look of Huntwatch came about very organically. The footage has a natural progression through time and each generation of the Huntwatch looks very different. We wanted to keep the integrity of this look, so the 1970’s had a nice rich film quality, the 90’s had some rough chaotic video, and the modern hunt had the very crisp clean clinical feel of HD video. A major theme running through the film is that images and media were the weapons used to fight against the hunt. We tried to hint at this by using film imperfections, video glitches, and behind the scenes moments. 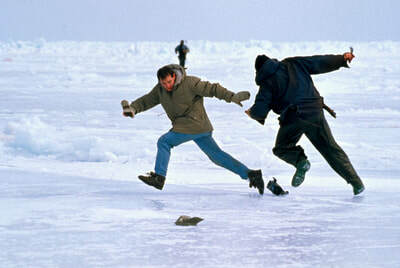 The Canadian seal hunt is a very complicated issue. Seal hunters are an easy target for blame, but the reality is that it is not that simple. Our goal was to tell an honest story bringing both sides of the debate to life as well as the political influences. This was a challenge because killing an animal naturally evokes heightened emotion. To counterbalance, we worked diligently to show the humanity of the hunters as much as possible. At the end of the day, they are just guys doing their job. ● What do you see as the impact of the individual, group or movement featured in the film? What real tangible impact do you hope to achieve? Four million seals have been saved since the International Fund for Animal Welfare (IFAW) had their first big win for seals with a European ban on newborn harp seal products in 1983, which shut down the hunt for several years. In more recent time, animal activists achieved another win in 2009 with a new and improved seal product ban in all EU countries, but this time it prohibits the trade of any seal regardless of their age or species. This was a huge victory for seals and slowed down the hunt considerably from 355,000 seals killed in 2006 to 76,000 in 2009. Although seal quotas remain in the 400,000 range – far fewer seals were killed in the commercial hunt last year and each pelt is valued at only about $25 compared to a few hundred dollars in the hay day. The number of sealers is dropping too from 6,000 in 2006 to only 400 today. Government subsidies keep the hunt alive and ironically these hand-outs actually outweigh the profit generated from selling seal products. In fact, the CA government provided more than $20 million from 1996 to 2001. The good news is that those numbers are decreasing, but without a complete end to this funding; the hunt will continue.Eighty thousand people have already joined IFAW, signing a petition to Prime Minister Trudeau to stop the subsidies, buy out the sealer’s licenses and invest in other industries. Across Canada most people actually oppose the commercial seal hunt. Sealing has been enmeshed in the culture in Atlantic Canada and people have been afraid to speak out on such a heated issue. Lead Huntwatch character Sheryl Fink is taking a grassroots approach and has formed relationships with a few hundred concerned citizens in sealing communities, screening Huntwatch to enthusiastic audiences and gathering petition signatures. Highlighting the untold story of one of the most important animal welfare issues of our time, Huntwatch is sure to make a big impact on everyone who sees it. And once they realize that baby seals are still being killed, they will join Sheryl Fink, sign the petition to end government subsidies and relegate the hunt to the history books. Thirty-five countries around the world now have seal bans in place and now we just need one more. We are making progress. The film has been publicized as a “Must See” movie by critics at both Indiewire and the Santa Barbara Independent. Canadian born narrator and Hollywood star, Ryan Reynolds grabbed headlines like, “Ryan Reynolds is Using his Voice to Help Save Baby Seals” and “7 Pic Pairs That Prove Ryan Reynolds and Baby Seals are a Match Made in Heaven.” It showed at festivals throughout the U.S. to engaged audiences, who want to do their part to help. The incredible attention of Discovery and Lionsgate is bringing Huntwatch to vast audiences and creating a ground swelling of support, which will end the hunt once and for all.